With more people aiming to stop smoking tobacco, the hunt has been on to find a substitute which will satisfy their needs and be free form nicotine too. For an increasing number of smokers, Real Leaf is the “real” thing. The company was established in 2012 and was aiming to find an alternative to the established tobacco brands. After years of much effort and research, many users now believe that Real Leaf has succeeded with the ultimate smoking product. Real Leaf is now regarded as the global leader in the tobacco substitute manufacture and supply industry. Some of the very best tobacco free herbal brands, all lovingly handcrafted are produced by them. Users have spoken about the delicate flavour and the quite unique aroma of their products. These iconic nicotine and tobacco free herbal blend comprises 100% raspberry, marshmallow and mullein leaves, all designed to make your smoking cleaner and far more enjoyable. 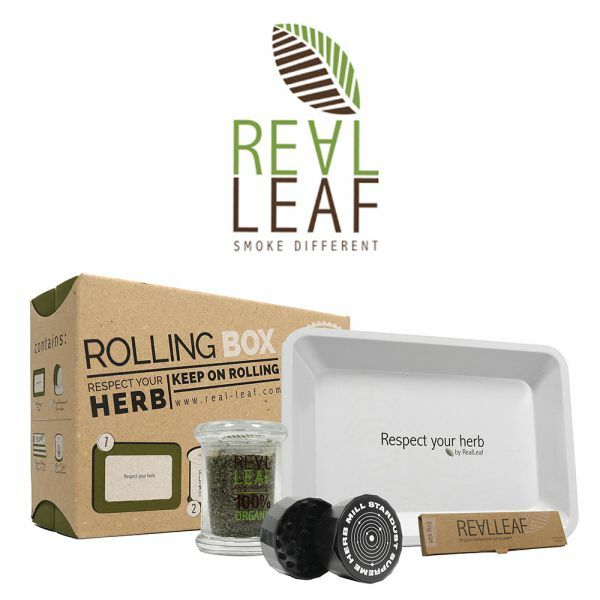 Real Leaf Rolling Box Set is now in their portfolio and is perfect if anyone is looking an all-in-one solution for all their rolling needs, we can say that this certainly fits the bill. The set consists of an airtight glass container which comes full with a complimentary batch of Real Leaf Herbal Tobacco Blend. We offer this Real Leaf Rolling Box at only £11.99 and for this you will receive: 1 x Metal Rolling Tray1 x Airtight Glass Containe1 x King-size Organic Rolling Papers + Tips1 x Professional the grinder is offered in either white or black, all supplied in a smart display box. We can confidentially say that we believe that this package is carefully crafted with love and inspiration and is available at our web pages for you to experience.